The real beauty of Bacaya is convenience. 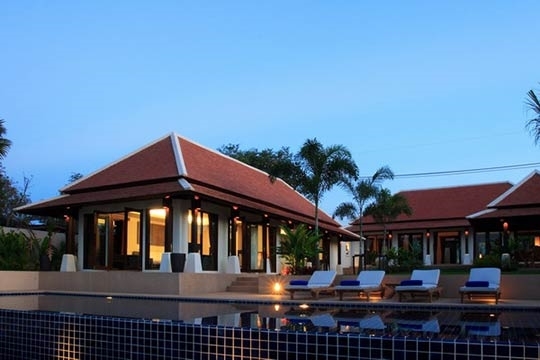 The villa's central position on Big Buddha Beach is not only attractive, but also perfect for a range of holiday pursuits; whether you want to go sailing from the beach, explore neighbouring islands or shop and party in the Samui tourist centres, Bacaya is ideally placed. Yet once inside, the villa also provides a pleasing sense of escape from the world with a quiet beach literally steps away and sublime views to gently drift into. A crisp, modern design complements the location, making full use of the relatively modest space, while the interiors combine practical ease and comfort with occasional Eastern touches, such as vaulted wooden ceilings and subtle Thai art. 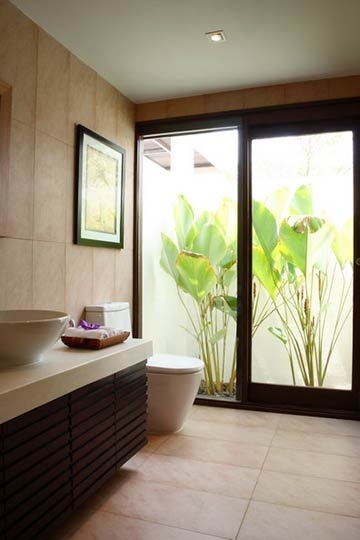 Regular maintanence and fresh paintwork keep the villa looking clean and new. Tall windows, wide terraces and a pleasant, lawned, tropical garden with an open-sided dining area creatively fuse indoor and outdoor living. Lazy days are taken care of by an inviting beachside pool and jacuzzi. Another plus at Bacaya is flexibility. 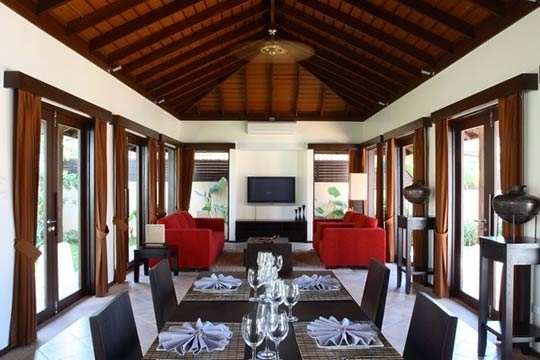 Although not suited to large groups, the villa comfortably accommodates one or two couples, a small family, or even two individuals, in its two double bedrooms. Added touches like the outdoor bath attached to the master suite and the breakfast bar in the kitchen provide guests with plenty of living and dining options that make the property feel larger than it actually is. 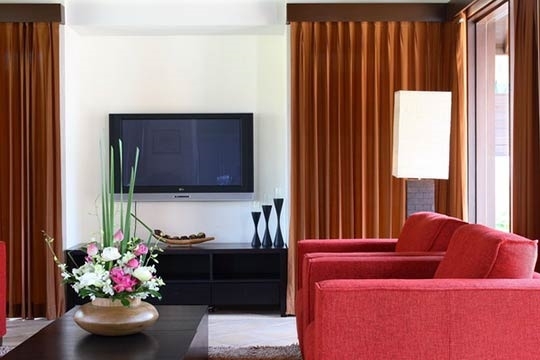 Though Bacaya is minimally staffed, most needs are easily met by the full-time maid (who prepares breakfast every morning) combined with a 24/7 concierge service. Unobtrusive help also guarantees privacy. With plenty of dining and shopping choices on the doorstep, self-catering is an easy option; however those who prefer a more pampered holiday experience can have a table set on the lawn and a private chef brought in (at a reasonable fee) for an alfresco culinary treat. Comfortable rather than opulent, Bacaya offers an exclusive holiday experience in an appealing setting. 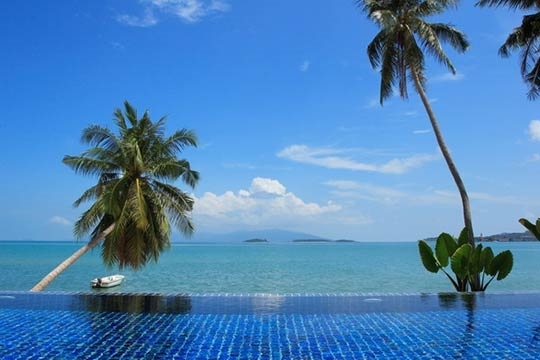 The high-walled garden, undisturbed views and beachside ambiance make for a relaxing, personal retreat within easy reach of Koh Samui's myriad attractions and temptations. Modest but comfortable beachfront living with a private pool. Bacaya sits almost at the centre of Big Buddha Beach, a popular residential area with a number of low-key beach resorts. The villa backs onto the main access road to the airport, which is lined with small shops, bars and restaurants. Although the road can get quite busy, it's never congested and a short walk takes you to everything you might need on a holiday, from sunglasses to medical treatments. For those who prefer to withdraw from the outside world, the beach is pleasant and uncrowded. Locals gather in the evening to swim and collect shells, while expat residents jog and walk their dogs as the sun sets over the western headland. For sailing enthusiasts, there is a small dingy sailing school next door. 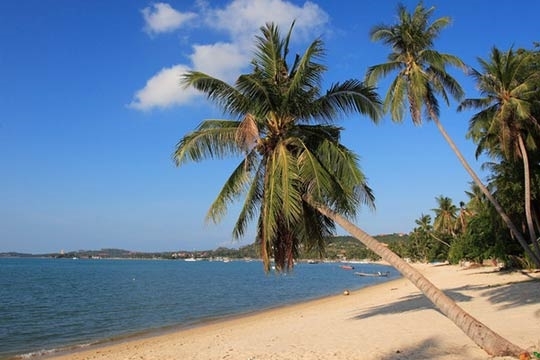 The sea is ideal for swimming year round but can be shallow during low tides. 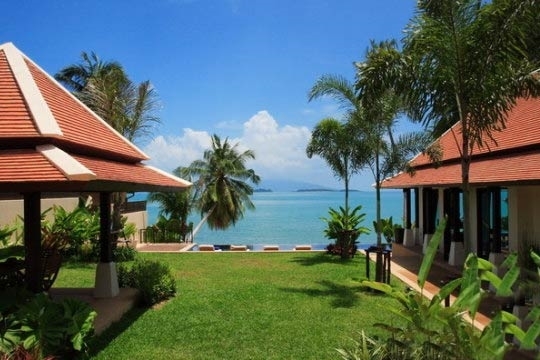 The stunning views, right from the property, take in neighbouring Koh Phangan and Samui's famous Big Buddha statue watching over the bay. Three jetties to the south serve boats to the nearby islands, but these are far enough away not to disturb. 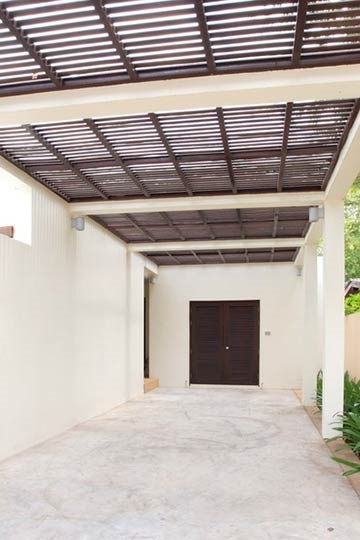 The location offers a balance between convenience and seclusion, with easy access to major tourist and transport hubs. Entering this holiday home from the roadside, a small, planted inner courtyard leads directly into a large, open living space surrounded by French windows that draw the eye across the lawn towards the beach. 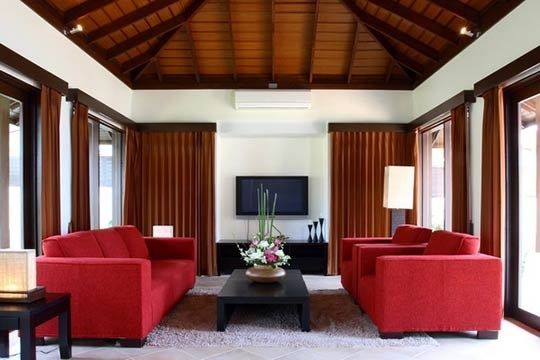 Simply furnished, this all-in-one, air-conditioned living, dining and kitchen area is a comfortable place to relax or dine, the vaulted wooden ceiling adding to the sense of space. A sofa and two armchairs inspire TV sloth and a dark, wooden dining table seats six. 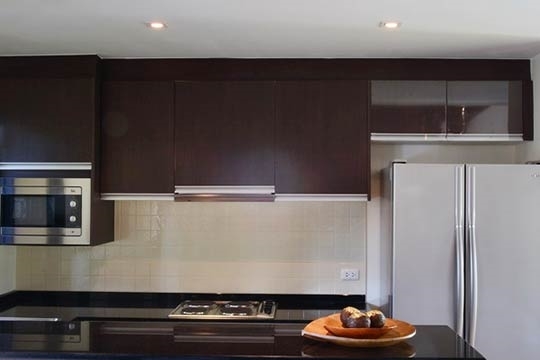 A modest but well-equipped kitchen is separated from the rest of the room by a black breakfast bar. 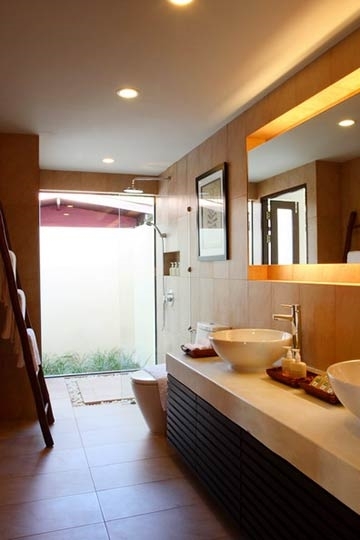 The living space also has its own ensuite bathroom. Double doors facing the beach leads out onto a wide, tiled sun terrace, then down to the lawn. 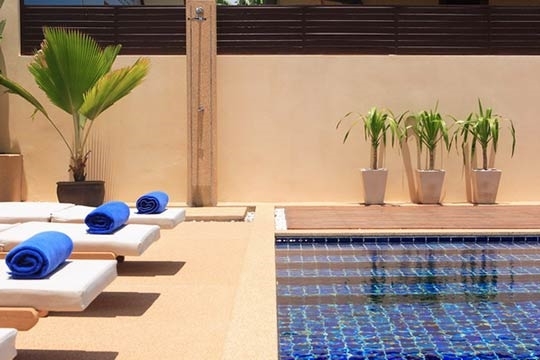 An outdoor Thai-style dining sala, complete with barbecue, lies between the pool and the living space, while to the right a sand-washed path leads to a separate two-bedroomed sleeping pavilion. The master bedroom is large enough to include a king-sized bed, sofa and TV cabinet, all carefully positioned to maximize the prime ocean views. 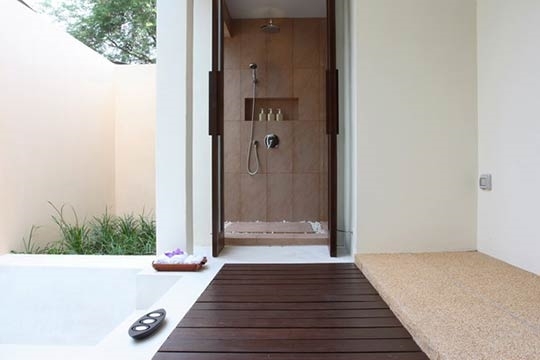 An extended, ensuite bathroom features raised ceramic washbasins and a walk-in rain shower, and opens onto a small outdoor courtyard with private sunken tub. The second bedroom behind is slightly smaller, but also with ensuite facilities and its own private walled terrace and tiny garden. Both bedrooms are air conditioned. 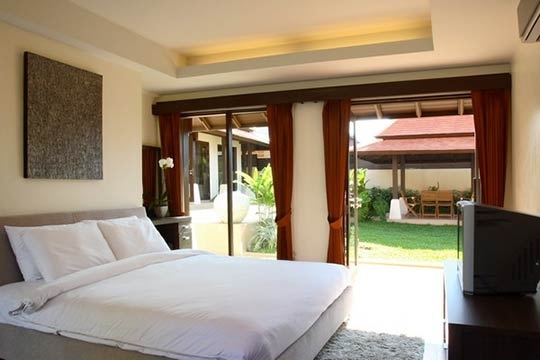 From the master bedroom, steps lead down to a 14m infinity pool that overlooks the beach. A sandstone terrace furnished with four comfortable sunbeds and umbrellas, plus an outdoor rain shower, complete the scene. At the end of the pool, the path continues past another lawned area to a private gate that leads from the bottom of the garden directly onto the soft sands of Big Buddha Beach. Rates apply to a maximum of 4 persons. 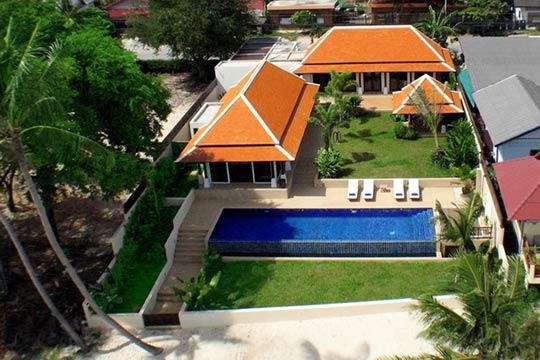 3 bedroom villa located in Bang Rak-Big Buddha, Koh Samui. Ideal for Beachfront, Body and soul, Kid friendly, Going for golf, Romantic retreats, Sensible for seniors, Room with a view.